Dimensions 0.75 by 5.25 by 11.50 in. A collection of stories inspired by the January 1995 Kobe earthquake and the poison gas subway attacks two months later takes place between the two disasters and follows the experiences of people who found their normal lives undone by surreal events. Amazon.com description: Product Description: The six stories in Haruki Murakamiâs mesmerizing collection are set at the time of the catastrophic 1995 Kobe earthquake, when Japan became brutally aware of the fragility of its daily existence. But the upheavals that afflict Murakamiâs characters are even deeper and more mysterious, emanating from a place where the human meets the inhuman. An electronics salesman who has been abruptly deserted by his wife agrees to deliver an enigmatic packageâand is rewarded with a glimpse of his true nature. A man who has been raised to view himself as the son of God pursues a stranger who may or may not be his human father. A mild-mannered collection agent receives a visit from a giant talking frog who enlists his help in saving Tokyo from destruction. 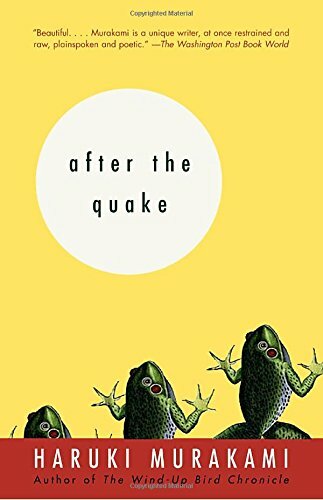 As haunting as dreams, as potent as oracles, the stories in After the Quake are further proof that Murakami is one of the most visionary writers at work today. About: A collection of stories inspired by the January 1995 Kobe earthquake and the poison gas subway attacks two months later takes place between the two disasters and follows the experiences of people who found their normal lives undone by surreal events.